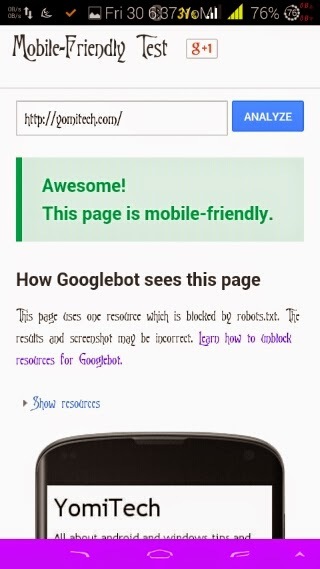 Google has just introduced a new feature to its search engine which automatically checks and lets you know if a website is mobile friendly or not. The good thing about this is that it’s going to save you the stress of navigating through a website to read its content as you are going to know if it’s a mobile friendly website or not even before clicking on the link. But this is going to be a very big problem for bloggers and webmasters whose websites are not mobile friendly. Imagine a situation where most of your traffic comes from search engines and as we all know google is still the leading search engine in the world. Then there will be a great decrease in the traffic as many people will prefer visiting a mobile friendly website. 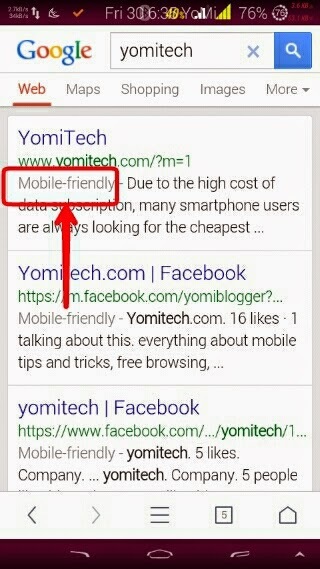 How to check if your website is mobile friendly: To know if your website is mobile friendly or not just click on this link and type the URL you want to check in the provided box. You just have to wait a little while the site is been analyzed to know if it’s mobile friendly or not. If it’s mobile friendly then you should get something similar to the image below. If it’s not mobile friendly then you will be given some few tips to help you make your site mobile friendly.